If you’re into Harry Potter at all, go to this. Go to it now.The Wizarding the Universal Studios Park, but yesterday we spent, I think, a little under 8 hours at Harry Potter, and 4 or 5 doing other things. 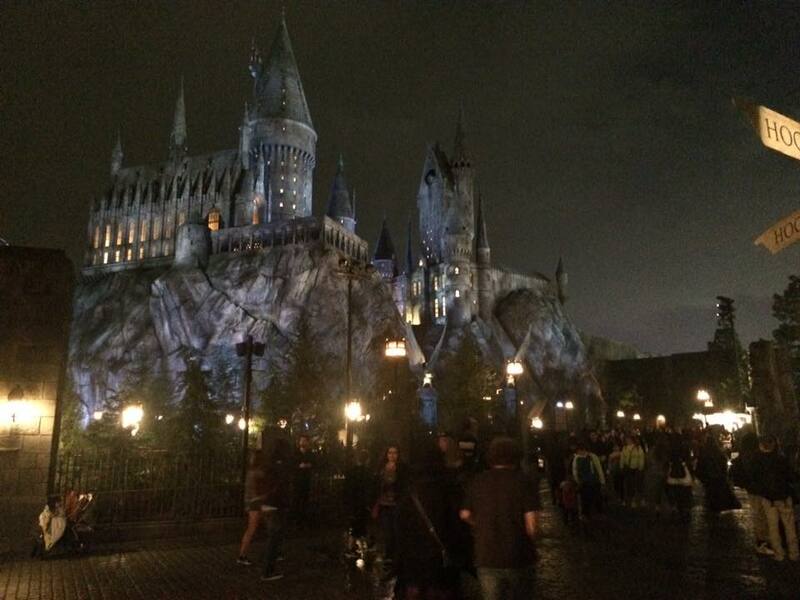 But then we were there specifically to check out Wizarding World. Yes, ON opening day. Because we’re completely mad. Wouldn’t this have been an awesome picture if my finger wasn’t in the corner? 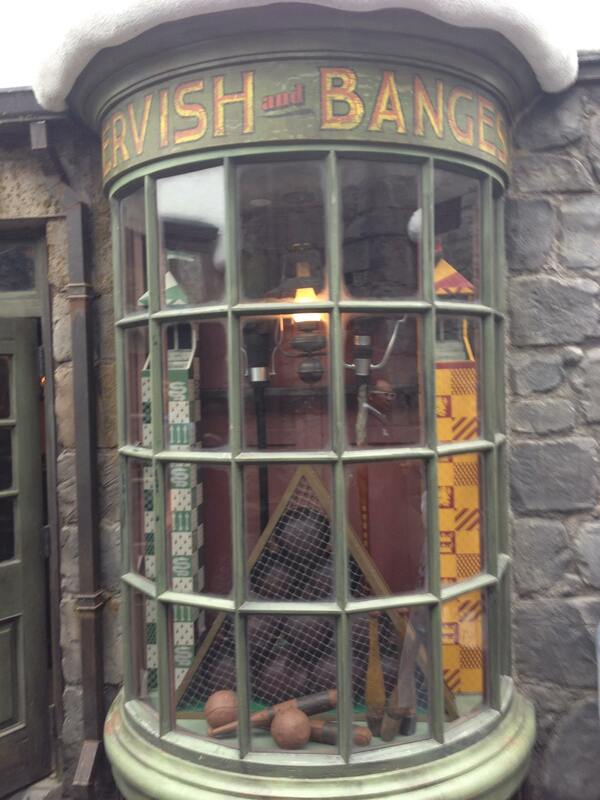 We got at the park at about 10 and you’re required to go to these kiosks to get a (free) ticket that has a time on it when we were allowed in Harry Potter World. But there was no time we had to leave. Once you get in you can stay all day. Our time was 12:00 noon, so we did the tour (which ate up most of the time) and the Simpsons ride (which has been there for a really long time, and I’d never been on. Turns out it’s actually really fun and completely mental. Still I miss Back to the Future). Then we went to the Wizarding World. It’s like stepping into the books or the movies. It’s pure magic. The music from the movies is EVERYWHERE. The first thing you see is the Hogwarts Express. And almost everyone was dressed in house colors. But it wasn’t just Gryffindor and Slytherin. It was all of them (the merchandise team has been really good about making merch for the other houses available). And the staff are all SUUUUPER into it. All throughout the park actually. If you wear house colors for the house they’re in, they cheer for you, and jeer at you if you’re in a different house (people shouted things at me like “two points for Slytherin!” and “sorry, no Slytherins allowed on the ride!” It was amazing). We went for the Harry Potter and the Forbidden Journey ride first. We were probably in line for at least an hour and a half. 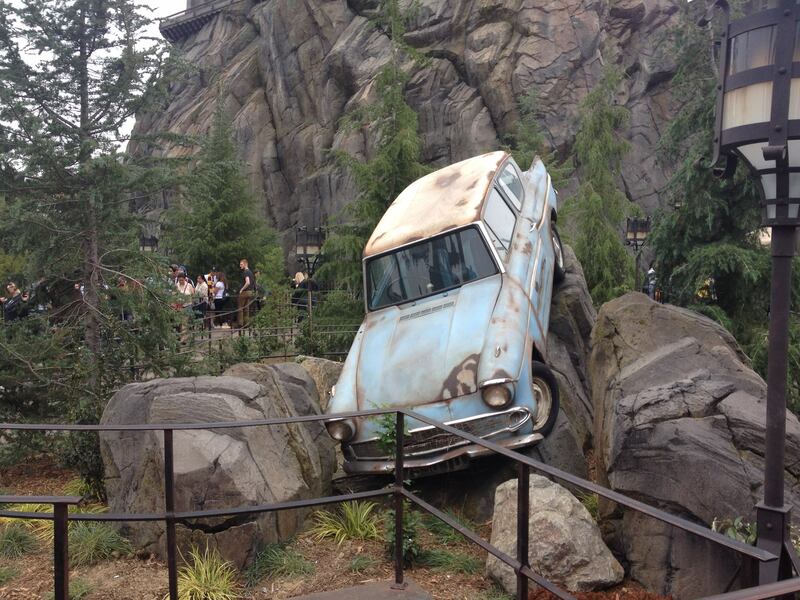 The crashed flying car is outside the castle, but the outside part is kind of long and not very exciting. And it started raining. But once you got over the fact that you were getting spat on by the sky, it actually worked in the park’s favor. Let’s face it, Hogwarts is in Britain. Weather just makes it more authentic. Before you’re allowed in, there’s a little side room where you have to put all your stuff in lockers. You WILL lose it if you don’t. But then the line goes into the castle. Really there should be a walk through option for people who don’t want to go on the ride, because the line may very well be the coolest thing about the park. Talking portraits, holograms of the characters (as portrayed by the actors in the movies), GORGEOUS props and set pieces (although at one point I spotted a compass in one of the display cases, and I totally bought it’s twin at Mortise and Tenon. But, of course, I count this as a plus). Things move around and talk to you. The line wraps through both Dumbledore’s office and the Defense Against the Dark Arts classroom. And there’s something to look at on all sides and sometimes even the ceiling. It’s so cool. And then there’s the actual ride part. It’s like…nothing else. There’s not even anything to compare it to. It’s unlike any ride you’ve experienced. They have four person ride cars and you have to get on by a walking sidewalk (like Haunted Mansion), but once the ride starts, you’re being suspended off the ground (kind of like if Soaring Over California was on a roller coaster track). It really flings you around. I heard we were completely upside down at one point, but I couldn’t even tell. On top of all this, you’re wearing 3-D glasses the entire time, so they get you through the grounds and the Quidditch Pitch and all this stuff, but there are also animatronics. So there will the a really excellent CGI spider next to you, and then you’ll get spun around and there’s a proper spider, inches from your face, movin’ around. They did this with dementors too. And I’ll be honest. I’m a grown-up, I’ve studied film, I know how there achieving a lot of what’s was going on in that ride, and I was still a little creeped out by some of it. But in a good way. The ride is incredible. Never felt the tiniest bit sick either. Apparently some people who are prone to motion-sickness had some trouble on the ride. Probably because of all the 3-D stuff. Personally, I had zero problem on that front. Then we waited in line to go to the Three Broomsticks for lunch. Fair sized line, but considering that you can sit down at a table for as long as you like, I was impressed at how quick they got everyone in. The food was really good too. 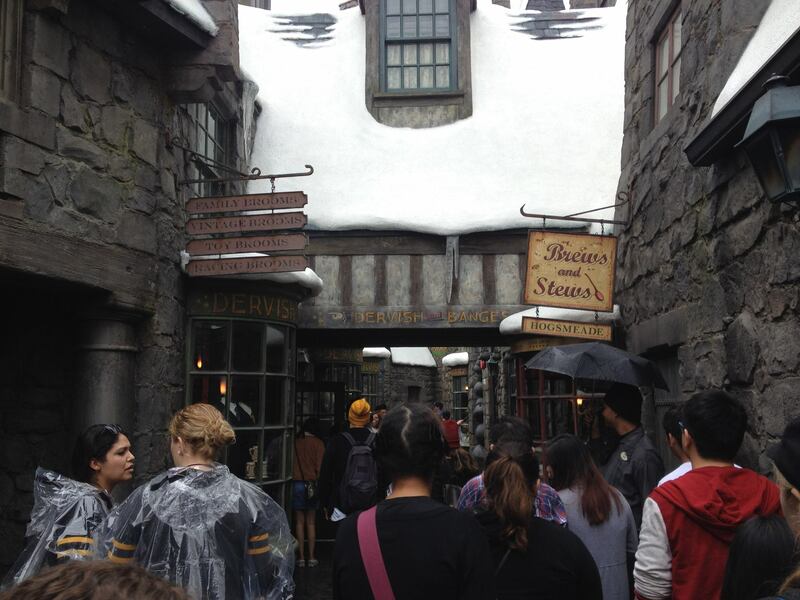 I got the bangers and mash and a butterbeer (which is like a really good cream soda) and my group all rested for a bit. Then we waited in another line to get into Ollivander’s for a wizard choosing ceremony. You can go to the shop via a much shorter line, but the option we chose allowed for a small group (probably a couple dozen people) to go in a little room first. There’s a person in there who selects someone and has them try out a few wands and things go wrong the first couple of times. Then a wand lights up where they stand, a breeze blows, all that jazz. You know, you’ve seen the movie. And then they let you into the store and you can purchase a wand and they’re super expensive. Well, they have less expensive wands that aren’t character specific (so you can have your own, which was tempting) and they look really neat, but they don’t do anything. There are character wands and character interactive wands. The interactive wands do things throughout the park. They go for about $50. I got one of those. The places you could do spells were marked with little plaques on the ground. And you really have to be precise with the movement or it won’t work. Then there was a line to go into Honeydukes and Zonko’s, where they have things like Bertie Bott’s Every Flavor Beans and Chocolate Frogs. The latter go for $11. And, yes, I bought one. In my defense, the packaging is a perfect replication and there’s a wizard card inside (I don’t know who I got yet, I’m saving my frog for the weekend). 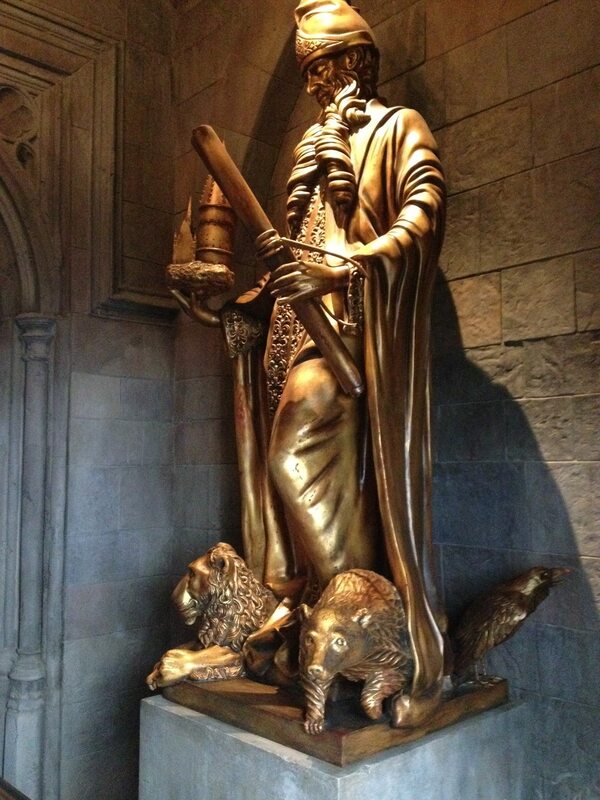 I think there are 5 different ones: Dumbledore and the 4 heads of the Hogwarts houses. There were a few other stores too. We just went into everything that we could. All the storefronts have really interesting and intricate displays and most of them move around in some way. The Hogshead sells alcohol (I think the 3 Broomsticks may as well), and you can walk around outside with your alcoholic beverage. They have some muggle beers, but also some themed ones. I tried the Witch’s Brew (a coffee stout). It was a really good, but heavy drink. And there’s a mounted hog head behind the bar that moves around and makes snarling noises. Really my only major problem with the Wizarding Worlds was that it was lacking, like, a bech. A couple of those would have been nice throughout. For people who want to just exist in that world, there’s no place to get off your feet and you’re on your feet all day. When we went back out to the rest of the park, we went to get another time for later, so we could see it at night, but they weren’t doing the times that late, you could just wander in whenever. At about this time the rain let up. Someone had bought Bertie Bott’s beans, and we took turns blindly pulling out a bean and eating it (really you sort of get those for the game element). Only one was so terrible that someone had to spit it out, but there were some really unpleasant ones among the cherry and lemon flavored fare. We did the tour again, then went down to the lower lot, got a bit to eat, went on the Mummy a couple times and Transformers. No lines for any of them, and that ate up a couple more hours. 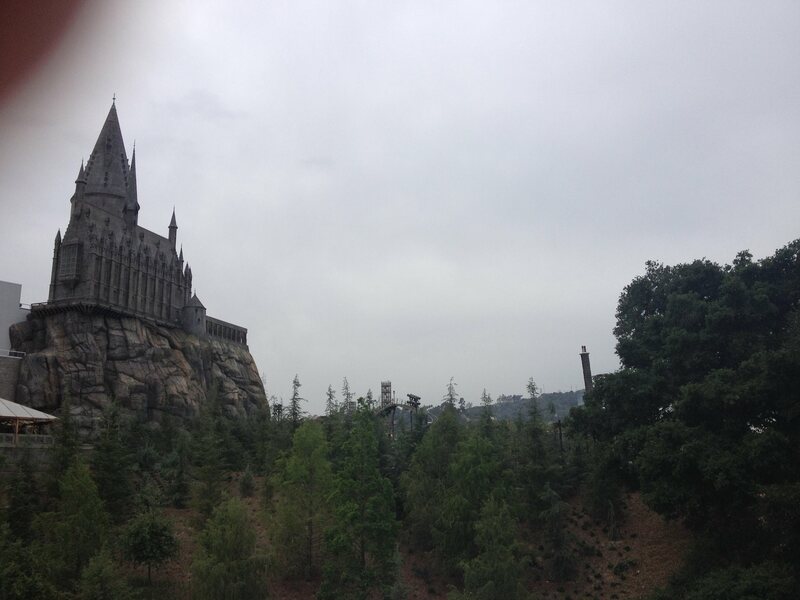 Then we went back to the Wizarding World. At night it’s a whole different experience. It had totally cleared out. The park was open until 11 that night, which probably had something to do with it (9-11 on a weeknight is probably about the perfect time to go, it just doesn’t give you a lot of time if you haven’t seen most of it already). People who had been there since the morning had gone, and most anyone with kids would have had to leave. We went on Forbidden Journey again and there was no line, then Flight of the Hippogriff, which also didn’t have a line. You get to walk past Hagrid’s Hut, which was neat). That’s like a tiny kiddy coaster, and only lasts a second, but you do get a really good view of Hogwarts. But the thing that was most exciting about the ride was the animatronic Buckbeak that greets you at the start of the ride. I love love love Buckbeak and basically anything from Azkaban especially hard, and it was one of my favorite things there (not really the ride, just the Buckbeak bit). And I did a couple more spells on our way out. The music played as we exited, and I could feel my eyes welling up. I didn’t want to go. It felt so real. Yeah, but that’s it really. This entry was posted in Culture, Fandom, film and tagged harry potter, hermione, hollywood, J.K. Rowling, magic, opening day, ron, sirius, universal studios, wans, wizarding world. Bookmark the permalink.